AllSeated has transformed the event industry from a paper-and-pencil approach to an all-digital platform by providing collaborative planning tools which allow event venues, caterers, planners, vendors and hosts to work together on creating memorable events. Event venues can benefit greatly from utilizing the digital tools available to them within AllSeated’s platform. By using AllSeated to collaboratively plan their events, event venues are considered more on-trend with technological advancement. They can expect to close more deals with remote clients. Event venues will achieve collaborative efficiencies among all parties involved on an event and will also increase in-house usage with minimal learning curve. With enhanced operational efficiency, AllSeated allows event venues to deliver accurate event renderings. They can simplify customization and maximize time savings while decreasing labor redundancies. AllSeated’s floorplan tools offer life-like viewing of floorplan layouts which effectively help to display the event’s logistics, flow and set-up. Event venues receive a very clear and concise picture of the event before it even happens. This allows everyone involved on an event to envision the layout and flow of a floorplan. If any changes need to be made, they are usually discovered during this part of the planning stage so that they are handled in advance of the event. Did you know that in the United States, one in every ten event floorplan diagrams are created in the AllSeated event planning software platform? For this reason, most event venues already have their floorplan templates uploaded in AllSeated’s system. If your event venue’s template cannot be found, provide us with a floorplan marked with at least one accurate dimension and our team will scale it and upload it into the platform. Using AllSeated’s furniture library, event venues can select the specific tables, furniture, and objects desired to create the floorplan for an event. Control the spacing between tables, the number of chairs around each table along with table numbers and table assignments. All of these details can be modified at any time while designing a floorplan. 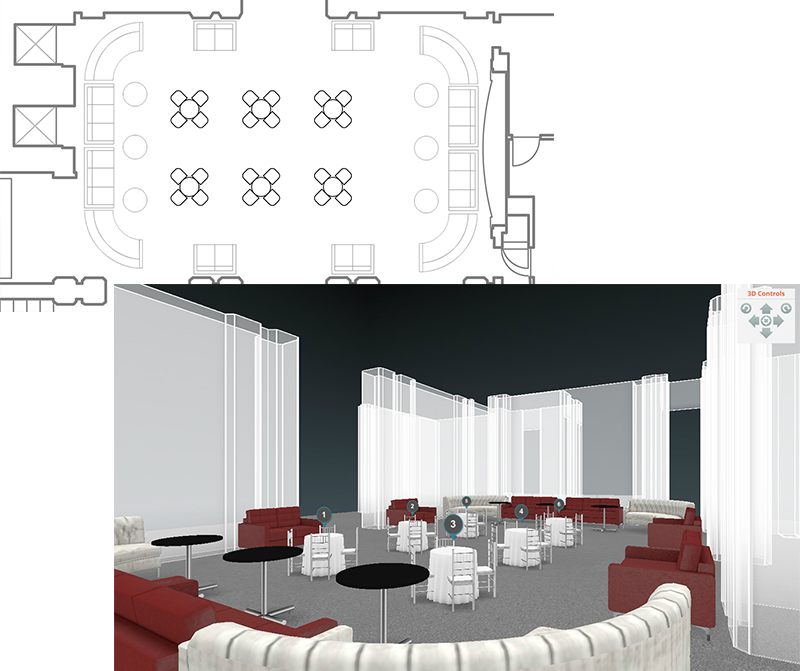 At any time while designing the event floorplan, switch between 2D viewing and 3D viewing. Event venues can use AllSeated’s 3D viewing options, both Bird’s Eye view and 1st Person view, to create to create a virtual walk through of an event! AllSeated’s guest list provides event venues with tremendous added value for their clients. Within the account permission settings, you can allow your client access to manage their guest list AllSeated and also easily seat their guests. Guest information can be easily entered and organized alphabetically, even filtered into specific categories based upon the event’s needs. Guest information can be entered manually or imported from Facebook or Excel. Within the guest list section, keep notes, store meal type requests, and track RSVP’s too. The guest list also allows for tracking guests and running reports in real time. AllSeated’s guest list features a direct link to seating. Clients can seat guests at the tables that are positioned within the floorplan. It’s simple to drag and drop guests at the desired tables. There is also the option to seat guests at specific seats at specific tables if needed. It’s easy to play around and move guests from table to table! AllSeated’s new virtual reality technology is geared towards enhancing the sales process, enabling event venues to close more deals. AllSeated VR delivers an authentic, sensory event experience that transports clients to a virtual reality walkthrough of event venues, bringing venues the biggest ROI in the history of event technology. With AllSeated VR, clients can view an event venue’s property regardless of where they are in the world. Tour a space in a 360 degree view at anytime allowing for a digital, life-like walkthrough of the event venue. This allows clients to have the onsite experience without actually having to step foot on inside a venue. Event venues which utilize AllSeated VR also improve customer satisfaction through visualization as floorplan layouts and event design can be experienced and achieved like never before. Learn more about AllSeated VR in this video!